I have always and forever considered myself a complete and total cat person. Sly has, since the 6th grade, been my one true pet love (I know - he's old). But then we got Dex. And he was so cute my icy cold kitty only heart melted a little bit. ANYWAY, what I'm saying is, I still don't like other people's dogs. Especially if they are big (I know, hypocritical much?). I still do not think I'm a dog person - I just happen to be head over heels in love with these two particular dogs. 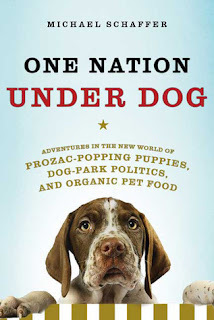 So I felt like given my sudden interest in all things doggy, I should give this book a try. I saw it on a friend's GoodReads feed and knew I needed to read about these crazy people who take their dogs to agility classes and buy them ridiculously expensive premium grain-free dog food and don't let them eat rawhide because organic bully sticks are better for them. Crazy people I say! So, basically, this book is an exploration of all doggy culture - the dog parks, the leash laws, the puppy clothes (too bad they don't make dane sized rain jackets and stuff or my pups would be decked out), the boutiques, the training, etc. Excellent. The author is easy to read, relatable, and cites his sources. He doesn't write from a snotty "can you believe these freaks" point of view, although he does highlight some pretty crazy behavior (puppy showers for new pet owners). He has an "aren't we crazy" tone as opposed to "aren't YOU crazy" tone that I really liked. And yeah, dog owners (including myself, I will grudgingly admit) can be our own very special breed (terrible pun intended). Again, loved it. I really want Luke to read it too, but I'm not sure it's his thing. I was calling him every few minutes as I read to tell him fun facts, though, and we are both crazy about the whole dog parenting thing (yes, we call ourselves mommy and daddy). If you have a pet, especially a dog, and especially a pampered dog, you'll love this one. Even if you don't, I think if you like animals you'll get a lot out of reading it. It's a great examination of people and current culture too. And a pretty quick read too! Now, if you'll excuse me, it's time for me to pick my "son" up from doggy day care and take him to dinner at a dog-friendly restaurant before we go to his agility class. Salt lamp Thank you very much for this useful article. I like it. Salt lamp Positive site, where did u come up with the information on this posting? I'm pleased I discovered it though, ill be checking back soon to find out what additional posts you include. Discussion: Are you a citation stickler? What I Read in July!